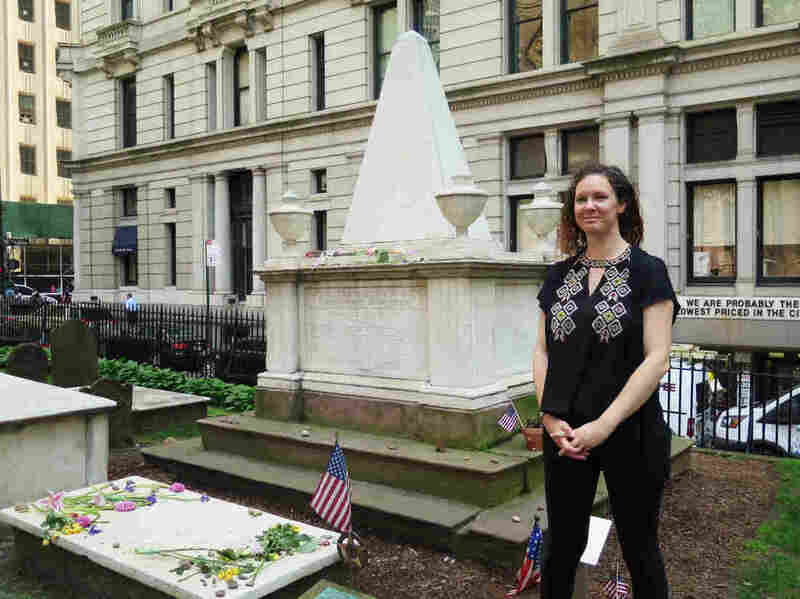 'Hamilton' Fans Pilgrimage To Founding Father's Once-Forgotten Grave The smash Broadway hit Hamilton is bringing legions of new fans to the grave sites of Alexander Hamilton and his wife, Eliza, both at Trinity Church in Lower Manhattan. Trinity Church archivist Anne Petrimoulx stands in front of Alexander Hamilton's grave in New York City. The site has seen a surge in visitors following the popular Broadway musical, Hamilton. "I wanted to see him and pay homage to him," she says, "because he is a forgotten founding father, I think. Never got to be president, and died so young!" Thanks to the musical, he's forgotten no more. Hamilton was just 47 when he was killed in the infamous 1804 duel with Aaron Burr. He's buried in the cemetery of Trinity Church, where he owned a pew (No. 92), and where five of his eight children were baptized. His grave is marked by an elegant white marble pyramid, surrounded by four urns. Visitors leave offerings on top of the base: roses, lilies, pebbles and coins. His widow Eliza, who outlived Hamilton by 50 years, is buried at the foot of his monument. "She tends to get more gifts than he does," notes Trinity archivist Anne Petrimoulx. "I think the musical makes people identify more with Eliza than with Alex." "We're close," Petrimoulx says with a laugh. "We're tight!" Self-described history nerd Stacy Kmentt of Chicago has come to the cemetery as part of what she calls her "pilgrHAMage" — "ham" as in "Hamilton." She's been making the rounds of various Hamilton historic spots in the city, and here she slips off her canvas shoes and places them gently on Eliza's grave for a quick photo. She's written a message on them in cursive, using gold, acrylic glitter paint. On one shoe, she's written "who lives, who dies"; on the other, "who tells your story?" It's the title of the final song of the musical, the big emotional finish of Hamilton. 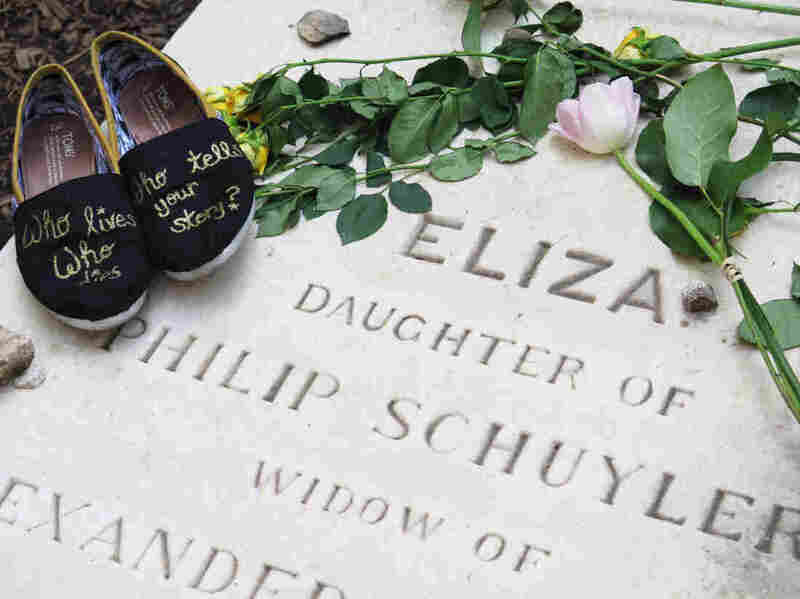 Visitor Stacy Kmentt photographed her shoes, which she decorated with a lyric from the musical, on top of Eliza Hamilton's gravestone in New York City. "Just how much he accomplished in his short life is phenomenal," Kmentt says. And that observation provides a handy motivational tool. Just think: WWHD? Kmentt agrees. "Every time I'm sitting around doing something lazy, I'm like, 'what would Hamilton be doing?' He would not be sitting around watching endless YouTube videos or Netflix, that's for sure!"